What a month December was. 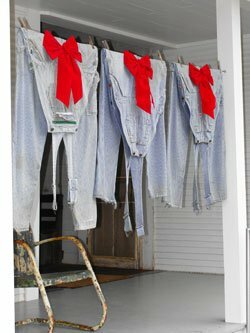 After being assured by the meteorological experts that the unprecedented dry weather pattern would continue into the fall and winter, and that we would all dry up and blow away, the unthinkable happened. It rained! It rained every week as a matter of fact. Instead of having far below normal rainfall as predicted, we actually received more than normal, around 7 inches for the month as I write this. This may not be enough to fill up a lake, but it was enough to fill up most local stock ponds (including my thirsty little cypress swamp out front) and to saturate the soil. My nephew, Seth, even got his fancy new pickup stuck in the mud. I didn’t think anybody would ever get stuck again. The drought has been devastating; but if we’d gone through another dry winter and then into a typically dry summer, it would have been catastrophic. Municipal water supplies remain a critical issue. I’m adamant that all homes in Texas should be required to have a cistern to catch runoff from their roofs. My five hundred gallon metal cistern is chock full and ready for the next drought or power outage. My lone source of water is a water-well, so when the electricity goes out, so does my well pump. That’s pretty often around here, as all it takes is for a squirrel to pee on the line to lose electricity. In addition to telling us that we’d get no rain this fall, the weather folks also said there would be no fall color. I have to admit, I was worried that there would be any live leaves left to turn color. Boy, were they wrong! At least they are consistent. Our fall color here bordered on being spectacular. It was arguably our best ever. The usual maples, blackgums, sassafras, sumac, sweetgums, and dogwoods showed out along with others that aren’t normally known for fall color, like Southern red oaks and even post oaks. 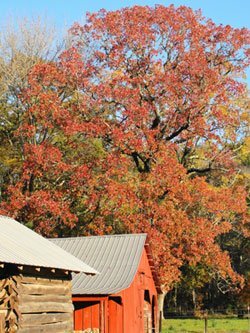 I don’t ever remember seeing a post oak with fall color, but the one beside my barn this year was actually a pretty shade of red. 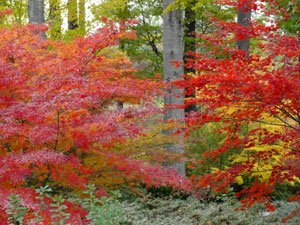 I love all trees, especially if they are dressed in a Joseph’s Coat, but I’m particularly fond of maples and have been since childhood. When I was a kid, I was in love with the sizeable burgundy leafed Japanese maple in Marie and Autry Daly’s front yard in Longview. I was their yard boy and they were the sweetest couple on earth. 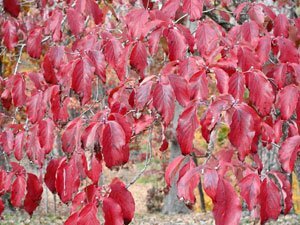 Because of its “red” leaves, even during the summer, she called it a “red maple.” It was in full sun and she kept it watered through a piece of clay sewer pipe that Mr. Daly had inserted into the ground beside it. Naturally when I saw cheap red maples advertised in the back of a newspaper I ordered a couple. I was so proud when the dormant sticks arrived. I planted them in the back yard and watched them spring into life. They grew fast, but it was very apparent they had green leaves instead of burgundy. The leaves were larger and the shape was different as well. After doing my homework I realized that I had ordered true red maples (Acer rubrum) instead of a “red” leafed Japanese maple (Acer palmatum atropurpureum) like dear Mrs. Daly had. True red maples are known for spectacular fall color so I figured I could live with my mistake. Of course any experienced gardener knows that they don’t peddle Japanese maples, especially red leafed ones, at cheap prices in the back of the newspaper. As each season passed, with limited fall color, I began to realize that my maples weren’t red maples either, but silver maples (Acer saccharinum) instead. Unfortunately silver maples rest near the bottom of the heap in the Miss Maple beauty contest, just ahead of homely Cousin Boxelder (Acer negundo). I cut them down and chalked it up to a lesson learned. I also decided to go to Texas A&M, major in horticulture, and learn botanical nomenclature so this wouldn’t happened again. Though Japanese maples are the showiest (and most expensive) of the maple clan, I’m partial to American sugar maples. Thanks to the last glaciations in the U.S. we are pleasantly blessed with native sugar maples in the South. Though the true sugar maple (Acer saccharum), of Canadian flag fame, lacks heat tolerance and belong in New England; its offspring adjusted to the warmer weather and climate extremes in Texas and persisted. These include our Southern sugar maple (Acer barbatum), chalk maple (Acer leucoderme), and big toothed maple (Acer grandidentatum). Southern sugar maples are native to woods along streams in all of East Texas over to Florida, and turn butterscotch yellow with occasional peach blushes each fall. The smaller statured and fairly rare chalk maple is native in a line from around Jasper, Texas over to Georgia and turns gold, orange, and red each fall. It’s my favorite maple on the planet. I can’t get enough. The big toothed maple is native along streams in the Hill Country and in the mountains of west Texas and turns yellow and orange during good years. This was certainly a good year here. The most spectacular place in the state was our own Stephen F. Austin State University Ruby M. Mize “Azalea” Garden, with its two hundred plus different Japanese (and other) maples under a mid story of native Southern sugar maples. The sight was breathtaking in early December. I’ve long thought the show in the fall there was more pleasing that the eye popping spring display. One reason I prefer the December show is that I’m often the only one there enjoying the scenery at the time. I also took my heirloom sugar cane to Jay Smith’s Chireno mill in December and made ribbon cane syrup. It was once the only source of sweetener in the rural South and everybody produced and made use of it not only as a breakfast syrup but also for cakes, pies, cookies, and candy. It’s the Southern equivalent of maple syrup. It’s an acquired taste, but I sell all I produce each year, mostly to older folks longing for the good old days. Hope your Christmas was merry. Hi Greg, I also thought the yellows, oranges and reds were more spectacular in 2011 than in other recent years.